Who doesn’t remember racing around the house Easter morning searching for your Chocolate Pizza? Okay, so back then, the Easter Bunny did not have Chocolate Pizza. Good news, times have changed and so has Easter candy. 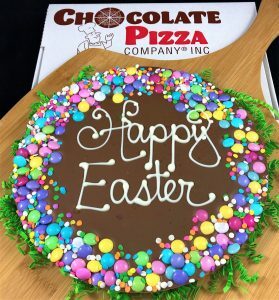 Chocolate Pizza Company has given the Easter Bunny an entirely new assortment of chocolate treats. It may surprise you to learn that Easter is the biggest holiday for chocolate sales in the USA. It beats out Christmas, Valentines and Halloween for all things cocoa. People love chocolate and many are making the switch to gourmet chocolate. Certainly, grocery aisle chocolate is fine for the ride home. But you don’t give it as a gift. Chocolate Pizza Company tempers the highest quality Swiss-style chocolate. The process of tempering chocolate adds strength, shine and a velvety mouth-feel. Consequently, it tastes much richer than ordinary chocolate. Of course, if your Easter Basket needs a classic touch, then the solid chocolate bunny is pure retro. Ninety million chocolate bunnies are produced every Easter. Surprisingly, 9 out of 10 Americans say you have to eat a chocolate bunny ears first. 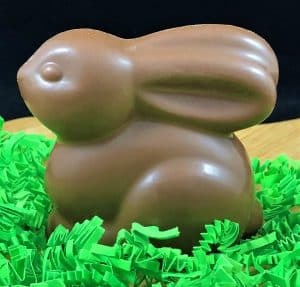 Chocolate Pizza Company makes a variety of solid chocolate Easter bunnies. There is a 4 ounce sitting bunny, a 4.5 ounce flat bunny and 3-4 ounce standing bunnies. Likewise, the Easter Egg is featured prominently in most Easter Baskets. 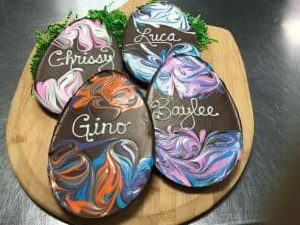 Chocolate Pizza Company’s famous Swirled Easter Eggs are edible works of art. Chocolatiers start with 6 ounces of rich milk or dark chocolate. But then the magic starts. Three hues of pastel colored chocolate is drizzled on the egg and blended by hand. The beautiful swirls create a unique chocolate treat. The Easter Bunny can even personalize the Swirled Easter Eggs. Chocolate artisans swirl the top and bottom of the egg and hand-script a first name in white chocolate across the middle. Personalized Easter Eggs are a one-of-a-kind Easter chocolate treat. But the big splash on Easter morning comes when the kids find the Chocolate Pizza. It could be a Spring Avalanche Chocolate Pizza with its bounty of chocolate and peanut butter pastel candies. Weighing in at an impressive 29 ounces, this is like an Easter basket in a pizza box. But, you could opt for the “Happy Easter” Chocolate Pizza trimmed in a border of pastel chocolate candy and sugar confetti. It also is served in a custom pizza box for fun. Certainly, bunnies, eggs and Chocolate Pizza are the stars of Easter morning. But, not to be overlooked are the bite-size treats. Marshmallow Peeps are as Easter as the bunny. These squishy, delicious little dollops of brightly colored marshmallow make you smile. Chocolate Pizza Company takes a pair of Peeps and partially dips them in milk or dark chocolate. So good! Chocolate Pizza Company is Central New York’s largest chocolate maker. Owner, Ryan Novak, started as a dishwasher in his teens. In 2010, at age 21, he took over the business. He has transformed a small-town chocolate shop into an emerging national brand. Novak has been featured in Forbes, People and Entrepreneur magazines. He has showcased Chocolate Pizza Company on Food Network, Hallmark Channel, CNBC and CMT. In 2015, he built a 10,000 square foot facility to handle the company’s explosive growth. Chocolate Pizza has been enjoyed by A-list celebrities, hall of fame athletes, top business and political leaders. The website, ChocolatePizza.com, has received orders from 6 continents.